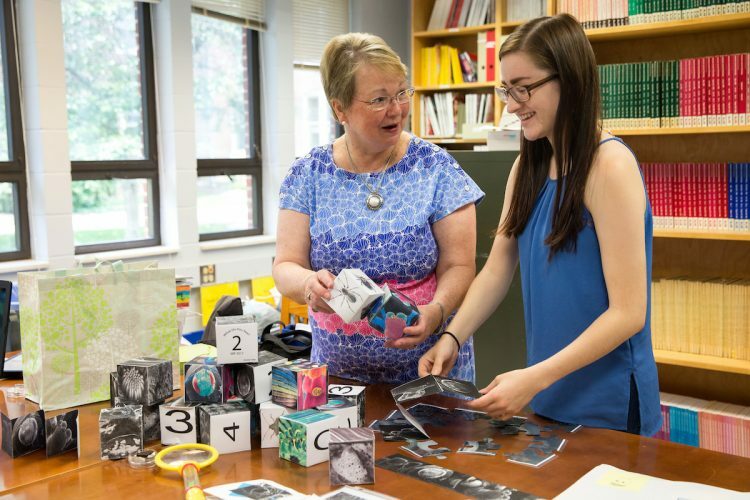 Like Santa Claus at Christmas time, Jasmine Fowler ’20 and education professor Cheryl Lindeman have been loading up a large bag with items for children to enjoy. But instead of toys, the young students they visit this summer will receive mysterious blocks, puzzles, and other objects meant to stir their curiosity. Fowler and Lindeman have deemed the mysterious, black Xfinity bag as their “Curiosity Kit,” which is part of a Summer Research project, and an ongoing study by Lindeman on inquiry instructional strategies. 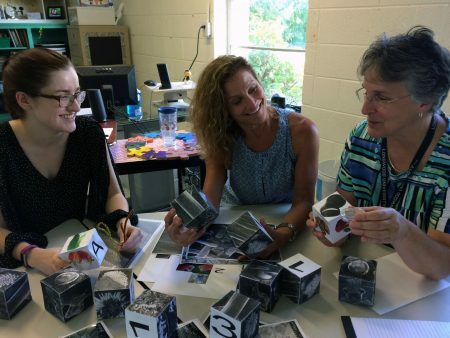 Jasmine Fowler ’20 shows the “Curiosity Kit” to New Vistas School teachers Susan Royer ’17 M.A.T. and Diane Roy. So far, Lindeman and Fowler have come up with multiple lessons to engage students at the Randolph College Nursery School and will coordinate lessons with teachers at New Vistas School this fall. Both the blocks and the puzzles they are using contain magnified images of living and non-living things like insects, plants, and foods, and children are asked to interpret what they see. The beauty, they said, is there are no wrong answers. For the project, Fowler has been able to combine several of her talents. Though she has yet to officially declare a major, she aspires to study physics education and become a teacher. She also has a passion for art and has enjoyed the creative, crafting aspect of the project. She can frequently be found at her favorite workspace in the lobby of Leggett Building, sitting at a table covered in art supplies and with a colored pencil in hand. Fowler took Lindeman’s introductory education class in the spring and was especially intrigued by the idea of conducting research with her after a long conversation during a Lunch and Learn session. She’ll even have the opportunity to present some of their findings at a National Association of Science Teachers conference in Baltimore this fall.